If so, I hate to break it to you, but it probably actually wasn’t. 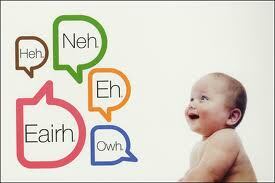 Every child in the world follows the same stages in learning to talk. No matter what culture you were brought up in, or what language you’re learning, you will go through the same stages. The first noise you made was [ʔ]. That’s a glottal stop; the noise you make when you drop the “t” in better or butter or glottal stop. Everyone loves a good old cry, and children’s cried have been identified into 4 different categories: hunger, discomfort, pain, and not to forget the fake cry. Then you began to make vowel sounds. Your tongue and lips were too complicated to use, so you just lay on your back and made vowel sounds to yourself. Then you said “mama” or “dada” and your parents jumped for joy. Your first word was about them! And so early on! Actually, you didn’t mean anything. The mouth is a complicated piece of machinery, think about the amount of noises you can make and ways you can manipulate your mouth. It took a while for you to figure out how to use it. Easy consonant sounds – b, d, k, l, m, n, p, t – came first, and to make them easier, you stuck a vowel sound between them and repeated that noise for a while. “Mamamama”. Your first word! … Or not. It wasn’t until you were between 10 and 15 months that you started to associate words with meaning, and finally uttered your first word.